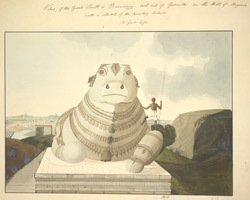 This drawing depicts the colossal sculpture of Nandi situated along the road that ascends the Chamundi Hill overlooking Mysore. The statue of Nandi, the bull sacred to Shiva, was carved out of a single boulder in 1659. Nandi is here represented seated and decorated with garlands and ceremonial bells.